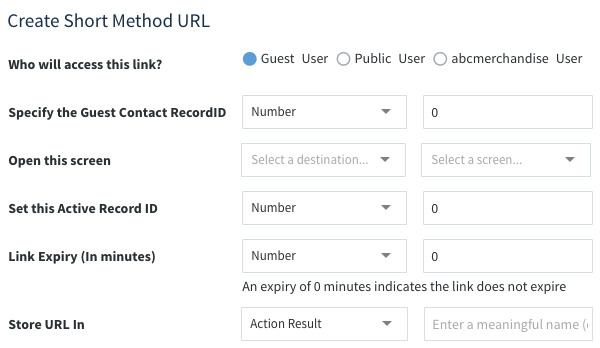 The Create Short Method URL action will create a short, unique link to a specific Method screen within your account. 1. Who Will Access This Link? Guest User: link accessible by a contact within your account. Commonly used for a contact's portal page. Note: Will need to specify the contact's Record ID (eg., the respective action result) so the page the contact reaches is specific to their data. Public User: link accessible by everyone. Method User of your Account: link accessible only by a Method user. 2. Open This Screen: the screen the link will show. 3. Set this Active Record ID: if the screen is showing a record, this will be the record id for the record being viewed. 4. Link Expiry (In Minutes): a link that expires will no longer work. Links can be set to never expire. 5. Store URL in: where the url link is stored.